This is my first blog hop this year for Toltec Jewels. 50 artists were sent a beautiful art bead designed by Patricia Handschuh and the theme of the blog hop was Colors of Dreams. I love color, it makes me feel alive, gives me energy and wakes up my creativity. So when I saw the colors in the beautiful art bead I received I immediately thought about one of my dreams of retiring to a far away place. Now not just any old place, it has have a tropical feel, be by the ocean. Where color is every where, ocean blues, lavendar orchids, luscuious pinks, sunny yellows, sunset oranges, palm tree green. Vibrant colors everywhere, in the cottages and stalls in the island markets. The islanders dressed in white with bright colorful hats, scarves, belts, women in sunny sandals. Island music that sets your soul floating, the body swaying. Waking every moring to look out the shuttered cabana window, where the white sheer curtains float and seeing the beautiful sea. Days lazing on the beach listening to nothing but the surf washing to shore, feeling the warmth of the sun. At least for the first month or two or three until all the stress melts away. Having no time table, being able to let my creativity flow freely. Setting up a canvas and learning to paint, creating beautiful pieces of jewelry using island beads or making my own. Letting everything else just disappear for hours on end and being one with the creating process. Late dinners on the patio, tropical drinks, tropical delicacies. The smell of surf, sand and exotic flowers on the evning breeze. The beautiful art bead brought all of those thoughts and dreams back in an instant. 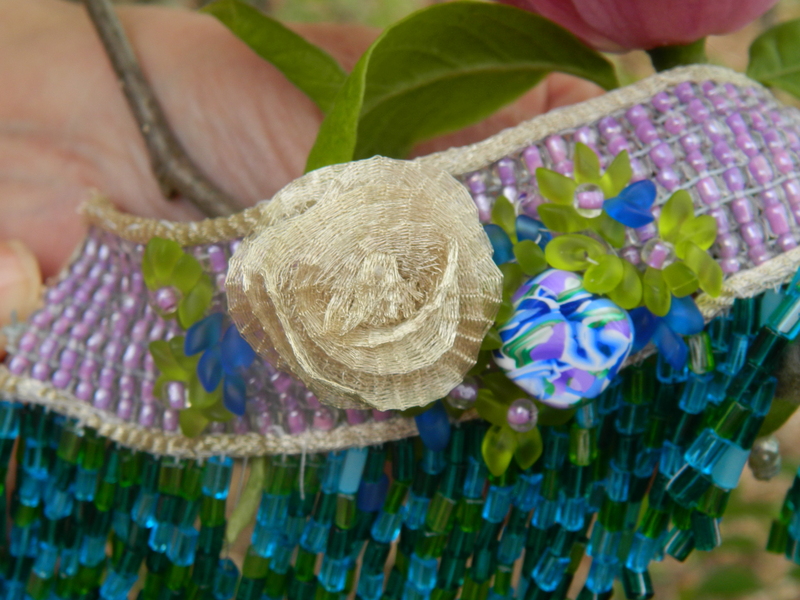 The radiant orchid, shades of blue and green in the pillow bead just all came together in this design. 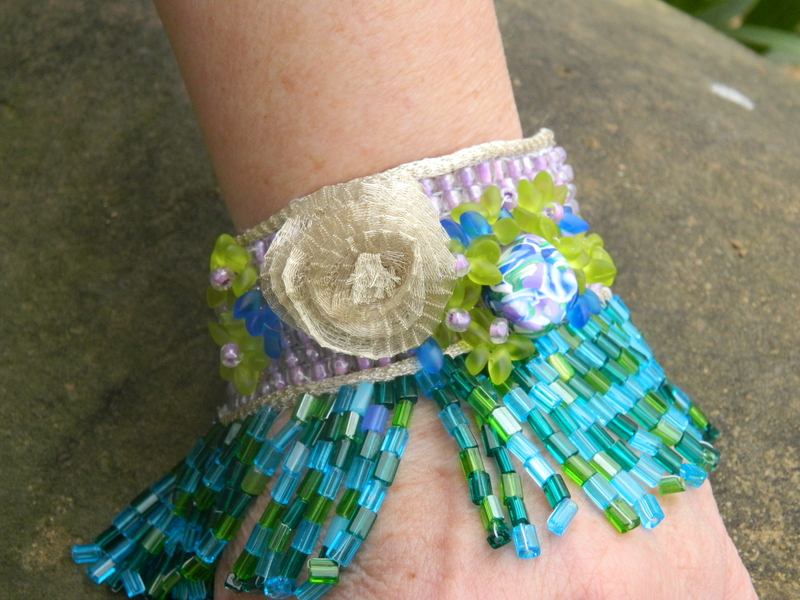 Using the Jewel Loom I designed what is now my very favorite bracelet, seed beads, blue/green long magatomas, adding an Artistic Wire Mesh silver rose, and enclosing the base in a silver mesh rope, then adding movement with bugle bead fringe. 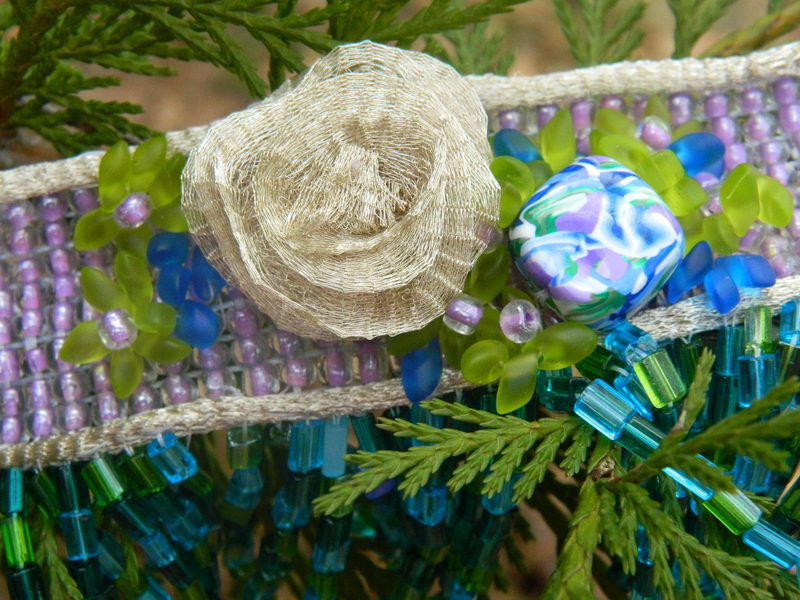 This bracelet was a dream to put together, every piece, stitch and item just fell into place as I created it. It brings the island feel of flowers and surf to mind and I can’t wait to wear it. Thinking even a new colorful outfit to set it off (Hawaiian shirt print maybe). Hope everyone finds the Colors of Dreams in something they love. Be it a person, place, thing an idea, your own business, retirement or helping others. Think about it and decide where the Color of Your Dearms will lead you.